OK, we usually don’t eat like this, but once in a while, it’s fun to indulge in some garlicky, buttery, cheesy, crunchy goodness. Then, start working on your butter & garlic mixture. You can either crush, chop, or grate your garlic. 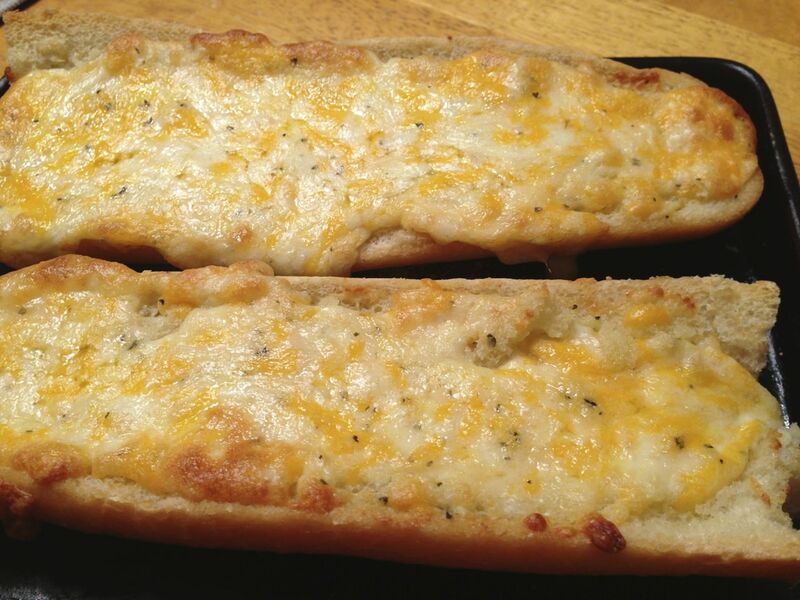 It just depends on if you want the actual garlic on the bread or just the flavor infused into your butter. 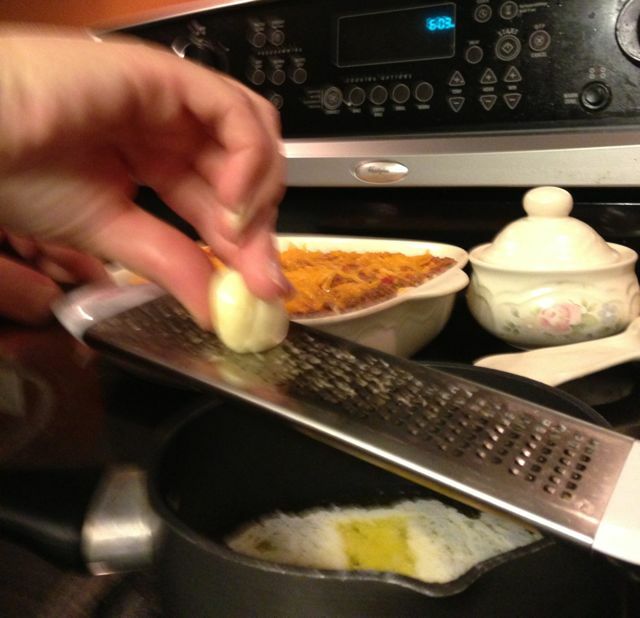 If you want the garlic, use a zester to grate the garlic into the butter. I decided to grate mine, and my 5 year old took this picture for you. Then just gently heat the garlic and butter while you’re working on the bread and cheese. 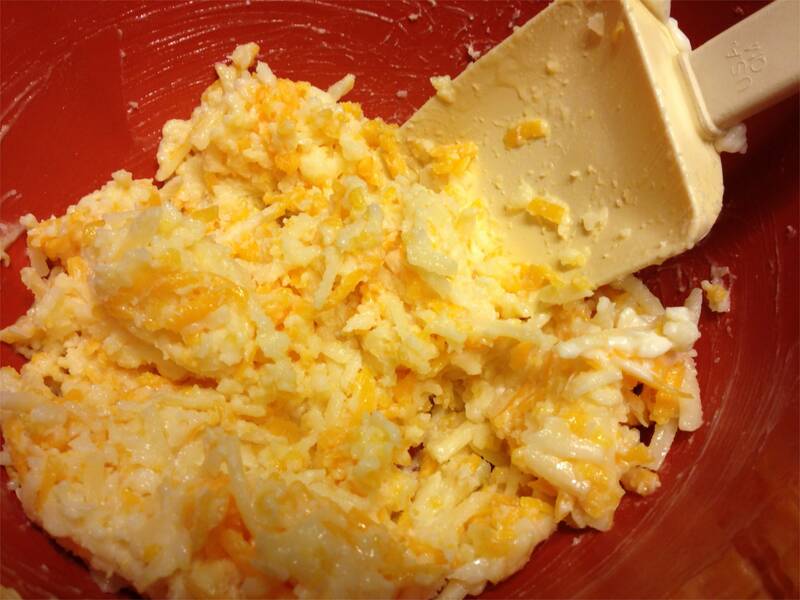 Mix the cheeses, mayo, and basil in a medium sized bowl. With a serrated knife, cut the loaf in half. Then cut each half horizontally. You’ll have 4 pieces; 2 tops and 2 bottoms. 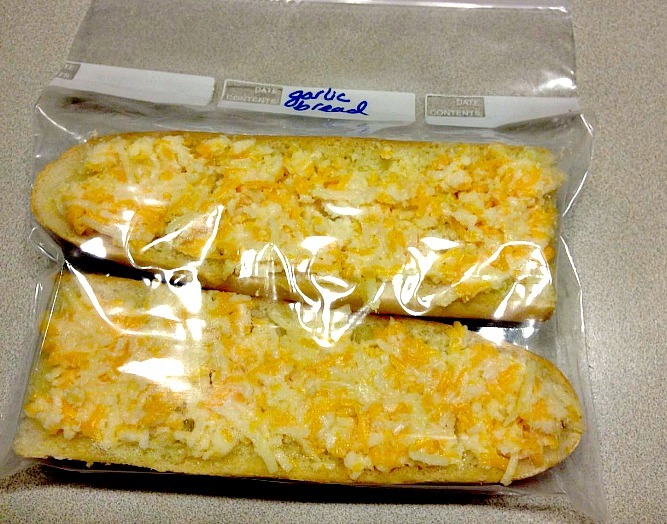 Put two sections in a freezer bag labeled “Cheesy Garlic Bread” and pop it in the freezer for another day. You may want to also write on the bag a note to bake on 400° for 10 minutes. 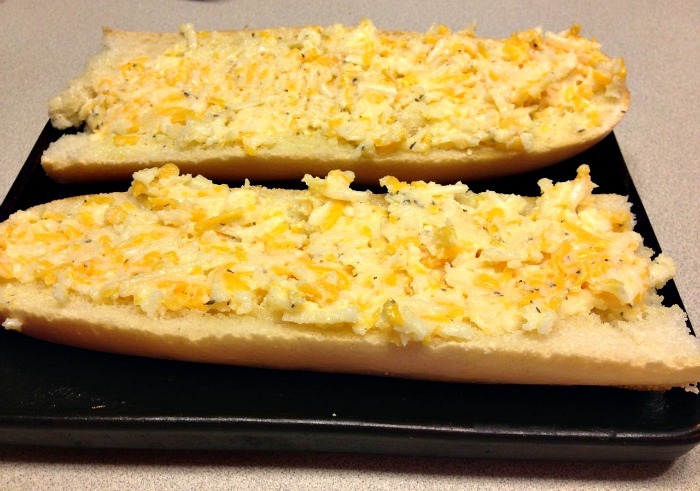 Put the other 2 pieces on a foil lined baking sheet and bake for about 10 minutes, until cheese is bubbly and the bread is golden brown. Cut into individual pieces and serve! 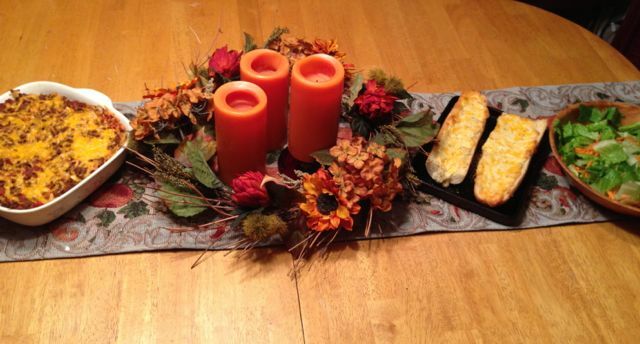 Here’s the meal we ate this particular loaf of bread with. That’s Sour Cream Noodle Bake if you want to make it too. 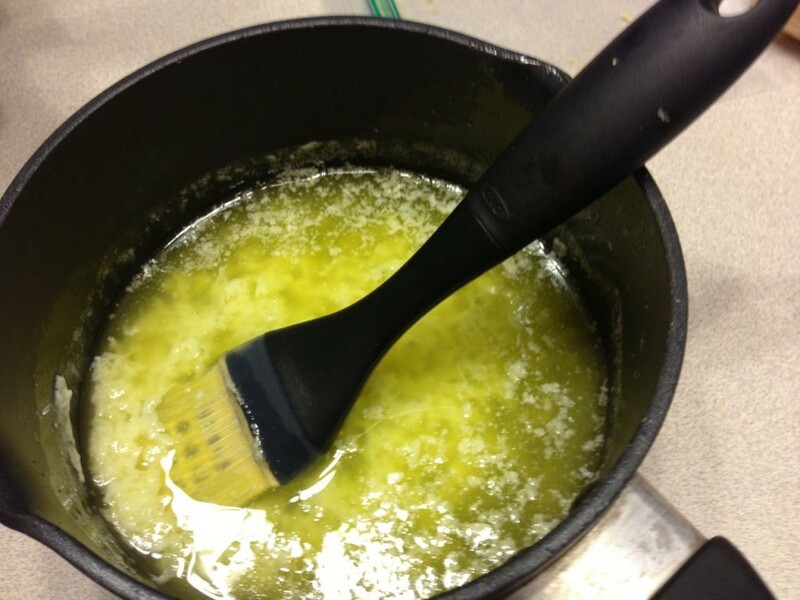 Place butter in a small saucepan on medium heat. To prepare garlic, break the skins off by hitting the cloves with something heavy like a soup can. Give the garlic a rough chop and add it to your butter,or grate it straight into your saucepan. (See picture). Let the garlic flavor infuse into the butter while you prepare the cheese mixture and bread. Mix the cheeses, mayo, and basil in a medium bowl. Using a large serrated knife, cut the whole loaf in half lengthwise, then cut each section in half horizontally, so you have a top and a bottom from each section for a total of 4 sections. Prepare a baking sheet by lining it with foil and lightly spraying with cooking spray. 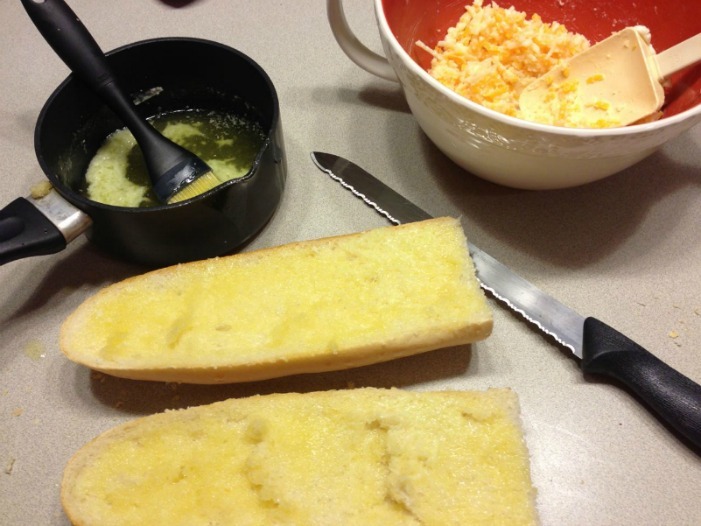 When the garlic butter is ready, use a pastry brush to spread butter evenly onto the bread. If you used chunks of garlic, just remove the chunks. If you grated the garlic, try to make sure you don't get too much garlic in one area. You don't have to use all the garlic in the pan, the flavor will be in the butter. 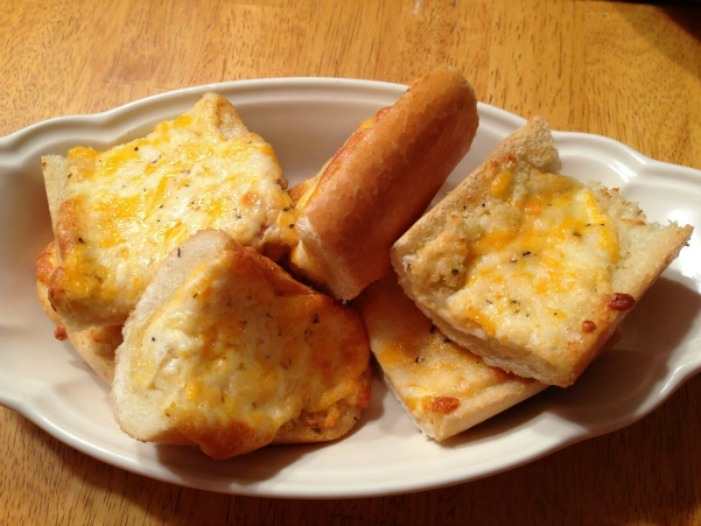 Divide the cheese mixture between the two halves of bread and spread evenly with the back of a spoon. Bake on the prepared baking sheet for about 10 minutes, until the cheese is bubbly and the edges of the bread are lightly browned. Been thinking of you a lot the last year or so, often wondering about you and if you’re ok. Haven’t figured out a good way to get in touch so decided to just comment on your recipe I’m using tonight. Pray you’re doing well and have a blessed and Merry Christmas.